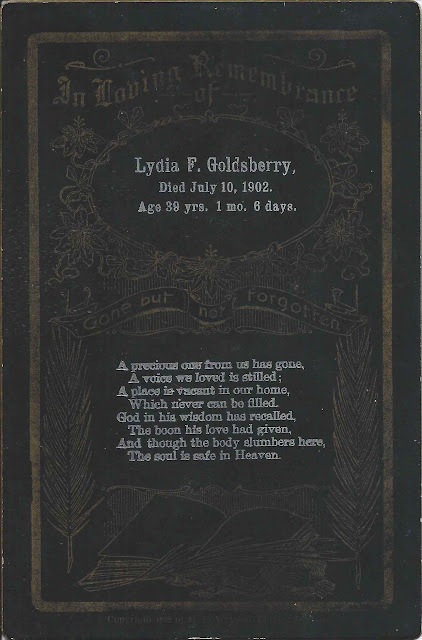 Memorial card printed upon the death of Lydia F. Goldsberry, who died July, 10, 1902 at age 39 years, 1 month, 6 days. I found a Lydia F. Goldsberry from Ohio who died in 1902, but her death record shows that she died May 10, 1902. This Lydia, whose age fits, was born Lydia F. Hornbeck, I believe, and was the wife of James Lawson Goldsberry; they're buried in Springlawn Cemetery at Williamsport, Ohio. If you a theory as to the identity of the Lydia F. Goldsberry who died on July 10 1902, please leave a comment or contact me directly. Thanks!